North America Dry Type Transformer Market size will exceed USD 1.5 billion by 2025; according to a new research report by Global Market Insights, Inc. 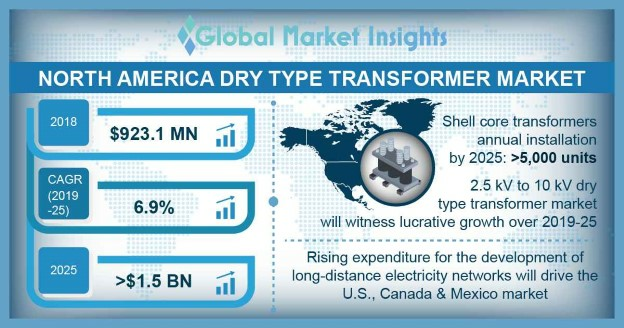 Rapid technological enhancements followed by favorable industrial inclination toward the revamping of conventional insulation technologies will boost the North America dry type transformer market. Exceptional endurance in extreme weather conditions in line with abolition of spills and leakages will drive the product demand. In addition, resistivity to rapid current flow & short circuits aligned with operational security and safety across indoor deployment will augment the industry growth. Shell core transformers are predicted to surpass an annual installation of over 5’000 units by 2025. In the recent years, these units have witnessed a considerable unit demand owing to improved productivities & economical cost structure in comparison to the traditional closed core units. Moreover, high-end product versatility in line with the incorporation of smart monitoring technologies will further flourish the market. Pole-mounted transformers have witnessed appreciable market growth on account of large unit deployment to serve the long-distance power distribution. Distant load centers across the region with minimal grid access offer immense potential for technological development which will further enhance the dry type transformer market. Efficient compatibility in high-tension applications coupled with advanced cooling properties, in comparison to its competitive counterparts will thrust the self-air technology across the dry type transformer market. Over the years, the product has gained significant integration pertaining to its optimal cooling strength & ease-of-installation. Health, fire hazards and leakages related to these units may however confine the product adoption. Class A and B units witness wide application across electrical infrastructure with low transformation capacity and comparatively lower peak demand. These transformers have observed marginal industry demand on account of the low consumer apprehension and substantial competitive influence from conventional insulation units. However, compact configuration, insulating property and effective cost structure are few indispensable elements driving the overall dry type transformer market. In the current scenario, cast resin units have witnessed an upsurge on account of their rapid technological developments and reliable operational performance. Manufacturers across the region, have continually been focusing towards the diversification of product applications and efficient technological advances which in turn will stimulate the overall dry type transformer market share. North American nations including Canada, Mexico and the U.S., have observed shift in the product demand on account of increased fund flow for the development of long-route electricity networks. Growing focus on the replacement of the old electrical equipment with advanced high-quality systems will further fuel the dry type transformer market across the region. Eminent dry type transformer market participants across North America include Toshiba, GE, ABB, Schneider, Eaton, WEG, Pioneer Power, Olsun, Rex Power, MGM, Hammond, Niagara Transformers, Neeltran, Marcus, CG, Siemens, Atlas, Virginia & Georgia Transformers, Deemsa and Electric Power.